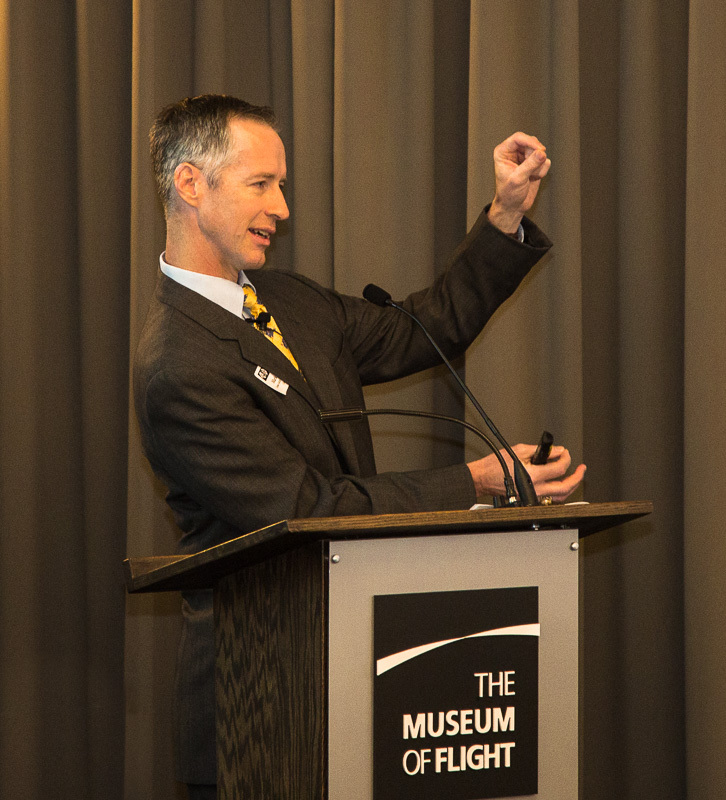 The 2014 Puget Sound Human Factors and Ergonomics Society conference was held on October 16 at the Boeing Museum of Flight. 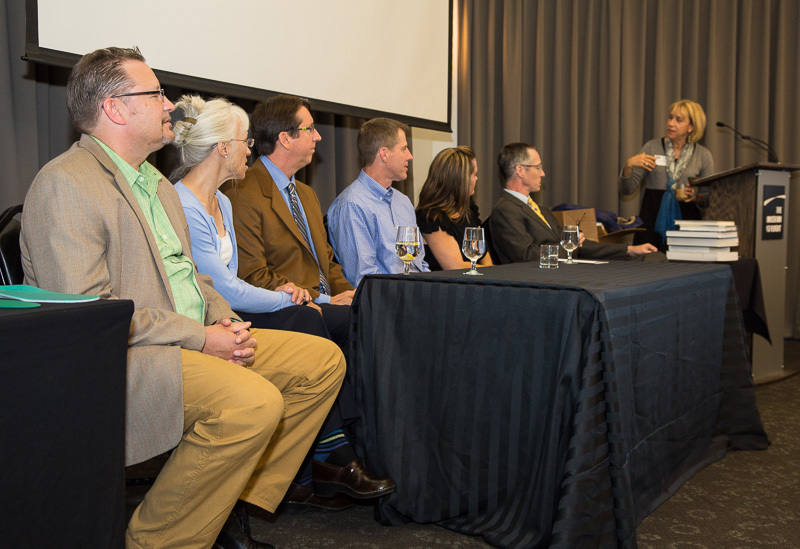 This year’s format offered a slight change in organization and brought with it six experts in Human Factors and Ergonomics from the Northwest and beyond. The symposium also gave participants the opportunity to visit unique vendors supporting ergonomic solutions to worksite adaptations. The symposium honored this year Lynda Enos as the winner of the Ergonomics Professional of the year. Lynda has made substantial contributions to the industry over the years and was honored for the dedication and professionalism she has brought to Human Factors and Ergonomics in the Northwest. 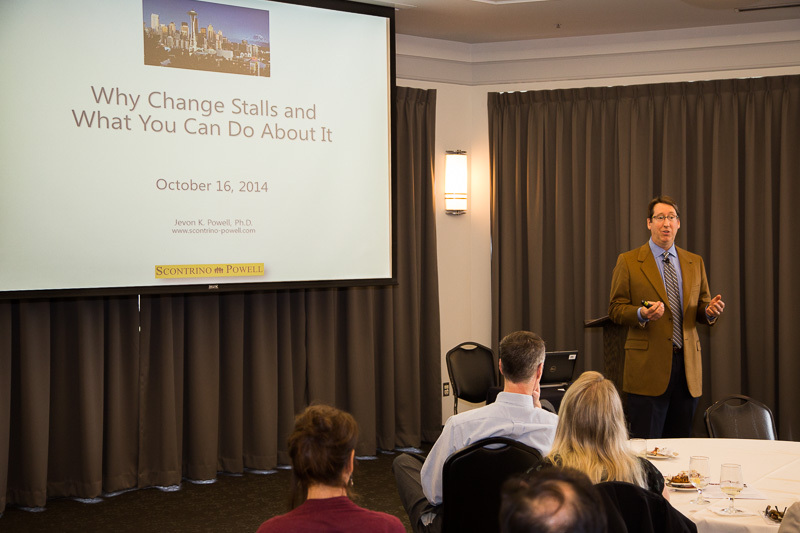 Mark Bendon , CPE, PhD from Texas A & M Ergonomics Center was the keynote speaker. 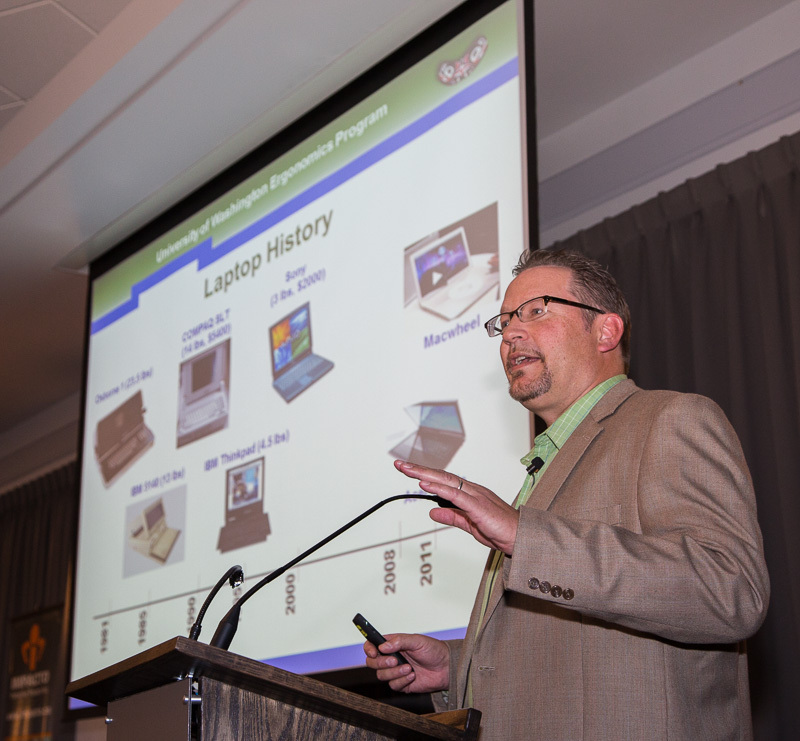 Mark spoke on the future of ergonomics assessments utilizing technology. Mark noted that two-thirds of all workers in the US are office workers. Due to the younger generation of workers entering the workforce with a longer history of technology use we are now seeing earlier and more frequent injuries of those in their early twenties. He explained this generation as “digital natives” vs. “digital immigrants,” those who are the older workers newer to technology. Mark also touched on the paradox of workers having higher, unhealthy BMI’s as a result of greater productivity requirements. Techno-solutions of this generation are wearable gadgets that help combat obesity and inactivity and monitor our every waking and non-waking movement. He explored the topic of “techno-addiction” dealing with the onslaught of devices and on-line media and questioned the stability of our health, income and relationships due to this issue. Matt Saxon, CSP from REI Employee Health Services and Risk & Business Continuity spoke on using risk management to enhance ergonomics initiatives. He defined types of risk as silos that contain, 1) Hazards, 2) Operational 3) Financial and 4) Strategic Risk. Matt gave several excellent examples of how risk to workforce members was mitigated at Lockheed and Amazon, by focusing on hazards and operational risk factors. Jevon Powell, PhD and organizational consultant in Seattle, Washington spoke on using change management to enhance ergonomics initiative.” Jevon focused on worker resistance to change and emphasized that “top-down, one-way” communication does not work to make change happen. Instead he introduced the Head-Heart-Hands model of communication which focuses on changing resistance to commitment to new behaviors. Communication is too often a one-way street and he encouraged more two-way communication efforts with management and the workers. He gave ideas of venues for two- way communication including face to face, town halls, brown bags lunches or milestone recognitions. He warned that there are too many one-way communication efforts such as the intranet, emails, surveys and newsletters that do little to enhance change. The next speaker was Jami Smith from the Boeing Company. Jami is the Well Being Leader at Boeing and spoke on Integrating Wellness Strategies into Ergonomics, Quality and Performance. She started her talk with a discussion of how cancer, heart disease and diabetes are driving up our healthcare costs. Mental, emotional and physical factors all combine to determine our health outcomes. Jami reviewed how deficits in each of these areas can contribute to poor performance in the workplace as well as poor health outcomes. Healthy workplace design can engage the workforce and help to keep us fit. She shared the strategies that Boeing is using such as on-site medical and health screenings, ergo specialists, health coaching and biometric screenings. Employees also have free membership to an onsite Boeing gym if they attend eight times per month. University of Washington PhD Professor of Environmental & Occupational Health Sciences, Pete Johnson, shared his advice on understanding laptop and tablet use and how to select the appropriate device. He took the audience through the history of computers and laptops leading up to present day use. He states that currently laptop use exceeds desktop computers and that the future is looking “phabulous!” Our time on the computer amounts to mostly mouse use which is 2-4 times the amount of keyboard use. He explained that research demonstrates that mouse studies show that the static input from mouse use is the “bad boy” of technology and much worse for us than the dynamic keyboarding actions which lead to repetitive stress disorders. Newer technology with touch-screen and small keyboards (phones, tablets) lead to overuse of the thumb: “thumb-centric.” With damage to the thumb we are at risk of losing 54% of our hand function. Pete also brought up the issue of the keyboard size as contributing to injuries and speculated that we perhaps need a “she-board” for keyboards since anthropometrically females do need something smaller and with less pressure. The current standard in keyboards is design to the 95th percentile. Jennifer Hess, PhD rounded out the presentations with a talk on “beyond” corporate stretching programs. She discussed how stretching programs became popular in the construction industry. Research however, began to investigate the effectiveness and question why they were being done. Findings indicate that the benefits were uncertain and mostly centered around moral and teambuilding rather than effectiveness of exercise outcomes. The efficacy of stretching in both athletes and workers is unclear and may cause more harm than benefit. Jennifer suggests that a well-rounded program of mobility with emphasis on stability, strength and coordination is a better approach. Muscle asymmetries can develop through work and be a cause for concern and a risk factor for injury. Functional movement screens can be done to identify weaknesses in workers. Greg Cook was given as a reference to a good screen. In summary her suggestion for effective injury Prevention Programs is 1) Education 2) Training 3) Physical Fitness 4) Ergonomics vs. a traditional one-sided stretching program approach. The culmination of the symposium was a panel discussion by all participants to discuss the future state of ergonomics. It was a lively discussion by all and the take home messages were that tablets were good for “snacking” but not necessarily all day use. Obesity and aging are our current epidemics. When asked to describe the perfect future workplace the following were given as ideals: 1) Adequate time off and flexible work schedules 2) total worker health and fitness programs available 3) managers getting training in ergonomics 4) customizable work environments including age appropriate adjustments, and 5) work-life balance measures. The symposium concluded with drawings for prizes from the vendors who generously donated products for attendees participating in visits to all the vendors. Please feel free to send us any suggestions on how we can make next year’s symposium even better with suggestions of what you would be interested in hearing and what you liked from this year’s event.